My inbox is full and I have no idea if people have been trying to send me any messages because I can't get rid of the messages that are in there.. I have been through every section of my profile and I have found every option to do everything else such as create folders, move messages, storing them even a way to mass check them off, but yet there is an option for everything else exept delete them, that is in plain view or that I can find. If it's there is' clearly hidden in some sub screen that I have no way of accessing. So If I can click on select all, then move them all, then I am supposed to be able to click SELECT ALL then click DELETE ALL as well. So please either add a Delete message option or if the option is there then move the option where it actually be fully viewed and can be accessed. Last edited by tx3000; 02-09-2011 at 10:25 AM. SELECTED MESSAGES -> DELETE -> Proceed. you fell for the troll. This is the guy who was asking for in depth guides how to get out of the starting zone, because it took him "14 hours". Also add a way to reply to Warnings from TrionCommunity. I was totally confused as to why I got one, when the quote provided gave no clue. Tried to reply with the rules of conduct broke down in comparison to the post in question and got a message saying TrionCommunity cant' accept replies. Not a big deal, but i'm CURIOUS! Trolls are really pulling out the old ones... guess the young community isn't inoculated yet. What's next, "Does /gquit not work for anyone else?" Sorry but nice try... care to try again..
too bad there isnt an option that says "selected messages" and a "delete" command inside of it....oh... wait a sec! what a shame.... a fail troll. This guy obviously needs a step by step instruction on how to delete messages, starting with "1: Grab your mouse with your right hand, or the left hand if you're left handed." He needs the same exactly the same step by step instructions to get out of the tutorial level in less than 14 hours also. ...or he's of course just a troll. It is funny though that there's a "Selected messages" button. I wonder what that does? 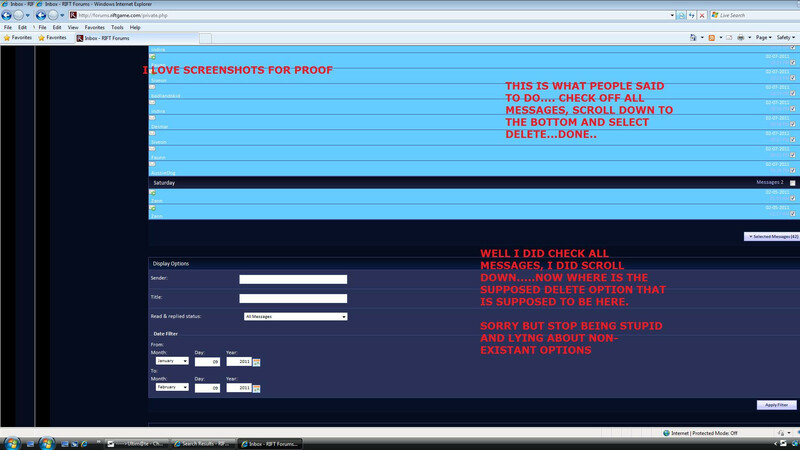 Oh, and it's amazing that he knows how to make screen shots and how to use/link them. But I guess he already found the step by step instructions for that somewhere. Edit: Oh, look. He knows how to use X-Fire. Last edited by MagrothJ; 02-09-2011 at 03:53 PM. Click it. a menu pops up with radio buttons. Click the one that says delete. Then at the bottom of that same radio menu click on proceed. Last edited by Belenos; 02-09-2011 at 04:11 PM. Yeah shows nothing more than the number of selected messages...So Who is trolling here....You're just being stupid and purposely going out of your way to cause problems. You know no one is even thinking that does anything so there is and would be no reason for someone to even think that can be clicked. How in the world is anyone supposed to know that is even a clickable option... Seriously that is ******ed. Last edited by tx3000; 02-10-2011 at 11:00 PM. You'd get ignored a lot less, and made fun of a lot less, if instead of yelling and calling people names and using the word "trolling" like some sort of incantation against people answering your questions, you listened and thought about things. But you don't, so *plonk*. Hahahaha!!! Sorry that is so funny. You should be a comedian. I guess you can put together your own step by step instruction for deleting PMs on the Rift forums now. It has a downward-pointing arrow on the button, which is a common standard in interface design to indicate a dropdown menu. I'm baffled by how you manage to navigate the interwebs. PS: Your threads are the best. It has a downward-pointing arrow on the button, which is a common standard in interface design to indicate a dropdown menu.